Do cats see in the dark? It depends on how dark it is. Can cats see in the dark, Thomasina? I want to move my cat's litter box to the basement. Will he be able to find it? Oh, no! Please don't move your cat's litter box to the basement. He'll hate that! Can cats see in the dark? That depends on how dark it is. While we see better than you do in dim light, we can't see in total darkness. If you move your cat's litter box to the basement, he'll probably be able to find it. But it could be so difficult, he might decide it's just not worth the effort. Did you know this? Humans see better in bright light during the day than cats do. But while it's not true that cats can see in total darkness, our night vision is so much better than yours. We need just one-sixth the amount of light you do to be able to see what we're doing. So how do cats see in the dark? The shape of our eyes lets in more light than yours do. And our eyes have a lot of rods, the cells that help us see in low light. The rods also help us sense motion. In bright light, they just switch off. That why you see better than we do during the day. 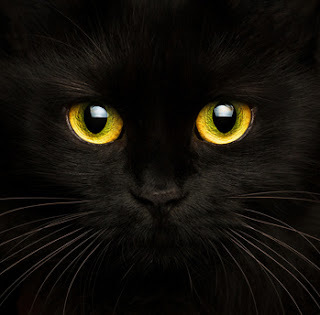 Something else that helps cats see in the dark is our tapetum lucidum (Our what??? My human typist is writing this, and I have no idea what she's talking about! ), a "mirror" layer behind the retina. If light coming into our eyes misses the rods, it gets a second chance when it bounces off that mirror layer. It's the tapetum lucidum that makes our eyes glow in the dark! Cats see in the dark for one more reason, too. While you can't see ultraviolet or black light, we can. That helps a lot when we're hunting before the sun comes up. But we have some other things going for us when it's dark, too. Our whiskers are like little antennae that help us feel our way. And our sense of smell tells us where we are. 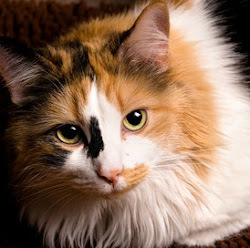 Your cat's whiskers and sense of smell would help him find his litter box in the basement if it's totally dark. But that sounds like so much work! Have you heard that cats are colorblind? That's not true! Your eyes have more cones than ours do, and cones respond to color. You live in a multicolored world, while the colors we see in our world are in the blue-violet and greenish-yellow ranges. So you know all those bright red toys people buy us? That red or bright green fades into gray for us. Personally, I like yellow and violet toys and beds better than blue. We can also see white, although it sort of glows for us. And it can feel aggressive. So if you want to hold your cat, don't wear a white shirt. And ask the vet to take that white jacket off! Calming colors for us are pastel purple, green and blue. Oh, and one more thing you should know: We're nearsighted. Objects more than 20 feet away look blurry to us. But things that are too close look blurry, too. So if you dangle the feathers on a wand or fishing pole toy right in front of your cat's face, he won't see them. Try to hold the toy a couple of inches away. I hope this answers your question, Just Wondering. And if you'd like to read more about cat eyes, check out these posts. Love this post, there's such great info here I wasn't aware of. I had heard that cats were colour blind so it's interesting to read about the colours they can see best, and to remember not to cuddle your cat when wearing white!! White definitely looks weird to us. My favorite color is pastel purple, although it doesn't look so great with my orange fur. It's amazing how differently vision work in different species, isn't it? There is an evolutionary reason for all that, which makes it even more amazing. Wow, just 1/6th of the light? What a completely interesting post. I've always wondered how cats can get around so well at night - very amazing! Wow how fascinating. I had read a little when researching about dogs but lots I did not know. I wondered why cat eyes glow in the dark. I am very disappointed about white as the kids in Kids' Pet Club have white lab coat jackets in the pilot (only colour available at the time). Karma the cat is not around much and doesn't love the kids but that could be a good story line. I better check on dogs and lizards and rats. Great information. I had no idea that cats were nearsighted - how do they hunt birds then? I like your color suggestions for toys and what colors cats can really see. Now I'm wondering about dogs, since I've always had dogs. I wonder what colors they really see. Cats tend to be specialists and hunt either mice or birds. Most of us prefer mice because catching a bird is a lot of work! Usually cats see birds when they're a few feet away and sneak up on them. But the bird senses the cat coming and flies away. Cats who catch birds also know where the birds hang out (a neighbor's bird feeder) and wait for them. But again, very few of us hunt for birds. I've never, ever even tried to catch a bird and don't intend to. For people who are concerned about cats and birds, our human just wrote about this Cat Bib. It's on Amazon.https://www.amazon.com/CatBib-Bird-Saving-Small-Blue/dp/B07HKVHXZJ/ref=sr_1_6? keywords=cat+collar+bird&qid=1553473369&s=gateway&sr=8-6. Something else in defense of cats: Studies show that cats rarely catch healthy birds. The ones who do get caught are in a weakened state and wouldn't have survived anyway. I know cats can see in some light. we always have a light on for them in the living room as they seem to prefer it. Outside they seem to get by with a lot less light! Ooh interesting post. I'm a cat lover and didn't know all this stuff about vision except the part about how using their whiskers helps aid in their sight. Thanks for this informative post! This is a lot of great information. I had no idea that white feels aggressive to cats. My sister has a shy cat, but he isn't shy around me. I almost always wear dark colors, I wonder if that makes a difference to him. Wow! Super interesting post. I had no idea cats were nearsighted. Good to know for the next time I play with my kitty friends! I had no idea that humans can see better in daylight than cats, that is so interesting!